I’ve had a fever for the past few days. Fever, headache, sore throat, swollen lymph glands. I can’t focus enough to read anything, nor can I think of writing anything witty. 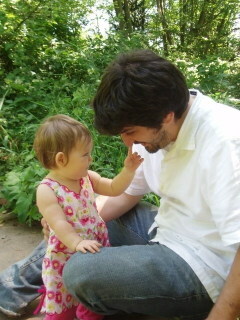 To make up for my disapperance, here is a picture of the world’s cutest little girl with her finger up my nose. This entry was posted in Nerd Stuff, Ramblings. Bookmark the permalink. What a coincidence… my favorite radio station is 102.7 The Fever!